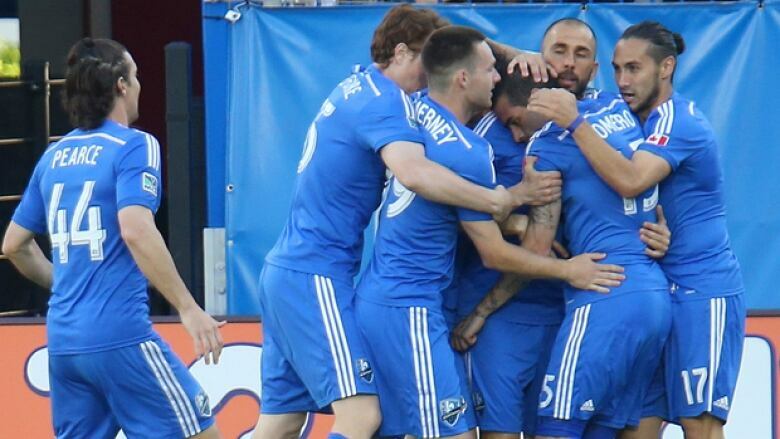 Andres Romero and Jack McInerney scored in the Montreal Impact's 2-0 victory over the New England Revolution in front of 18,068 fans at Saputo Stadium on Saturday night. The Montreal Impact wasted no time cooling off the hottest team in Major League Soccer. Montreal needed just three minutes to score the winner against a streaking New England club, shutting out the Revolution, 2-0 on Saturday night at Saputo Stadium. New England (7-4-2) came to Montreal riding a five-game winning streak, their longest such run in nearly a decade. The team was unbeaten in its last seven contests atop the Eastern Conference standings. But with fans still trickling in to their seats after the opening whistle, midfielder Andres Romero scored the Impact's quickest goal of the season in the third minute to give last-place Montreal (2-6-4) a surprise lead. Romero took a long through ball from striker Marco Di Vaio and moved in all alone on goalkeeper Bobby Shuttleworth. With Revolution defenders requesting an offside call on the play, Romero held onto the ball several seconds before beating the keeper for his career-high third goal of the season. "We came out, we dominated, and we did exactly what we wanted to do," said Jack McInerney, who played up front with Di Vaio in a seldom seen two-striker formation. Montreal followed the early goal with sustained pressure. Its emphasis on the long ball created several goal-scoring opportunities in the first half hour. "We had a stronger start than they did," said defender Wandrille Lefevre. "That made a world of difference. We controlled the ball and it allowed us to ease into the game." Many of the Impact's scoring chances fell to Di Vaio, who couldn't find the back of the net despite taking four shots on target in the first half. Di Vaio came close in the 17th minute when his strike from outside the 18-yard box missed the net by inches. A minute later, Di Vaio's volley from close range was stopped by Shuttleworth. In the 26th minute, the Italian striker moved in alone on goal, but tripped and fell. The Impact took eight shots on target in the first half to New England's one. "You have to credit the other team because they came flying," said Revolution coach Jay Heaps. "In this league, you can't give a team anything. "We gave quite a bit to Montreal and they took it. Montreal did an excellent job of taking advantage of our slow start and they were ready." Frank Klopas' men doubled their lead in the 31st minute after an impressive individual effort by newcomer Issey Nakajima-Farran, who made his Saputo Stadium debut after being acquired from Toronto FC two weeks ago. The left-winger cut into the middle of the pitch and fired a powerful strike at Shuttleworth, who bobbled the ball. McInerney pounced on the rebound from the edge of the six-yard box for his fifth goal against New England in 10 career appearances. Although he wasn't credited with an assist on the goal, Nakajima-Farran was instrumental on the play for the Impact. "It just clicks," said Nakajima-Farran, who played at the club level in Denmark, Australia, and Cyprus before making the move to Major League Soccer. "Everybody is playing simple, and the ball is zipping around. I feel conformable, and the guys know my movement too. It's been a very easy transition." Coming into this one with just one win on the season, seven points from 11 games, and a league-worst goal differential, the Impact's stingy defending settled a hot team that had scored 12 goals in its last three games. The Revolution couldn't generate much offence on Saturday despite controlling the ball for long stretches. Rookie forward Patrick Mullins, who entered the game with a goal in four consecutive contests, an MLS record for a rookie, was limited to just one shot on target. And 19-year-old Diego Fagundez, who scored four times on New England's winning streak, did not challenge goalie Troy Perkins once. "It wasn't our best stuff," said Heaps, whose Revs still top the Eastern Conference despite the loss. "It was one of those nights where every pass was a little bit off. It didn't have the same zip to it. To break a team down, you have to have things go your way a little bit. You have to credit a team when they do a good job." At the other end of the table, the win keeps Montreal at the bottom of the standings, but the team is now only six points out of a playoff spot. "The first couple of games of the season didn't show the kind of talent we have on this team, and what we can do," said McInerney. "If we want to get back into the picture, we need to be consistent." The Impact now turn their attention to a mid-week battle versus Toronto FC on Wednesday for the second leg of the Amway Canadian Championship final. The winner advances to the CONCACAF Champions League.